A wide range of fancy shapes is available to satisfy the most demanding tastes! 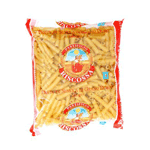 Be prepared to try all the available shapes of pasta Riscossa. Very fast to be prepared and always able to meet your authentic needs. Product of Italy.